I'm late to the 7 pieces 7 Outfits remix party. I wasn't going to do this but then I decided to try it out. So here is what I came up with. Please excuse the grainy pics. This could only be done inside. There are definitely more outfits that can come out of these seven pieces. I chose a pair of brown sandals as my one pair of shoes. Brown is my favorite color shoe to wear with everything, followed by Navy. Which outfit is your favorite? 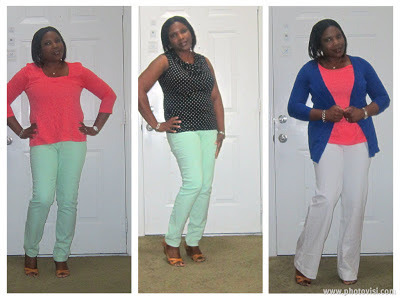 Great outfit combinations, my favorite is white pants, coral top and the blue cardi, fast second is the coral top and green skirt---just fantastic!!!! Loved this post! 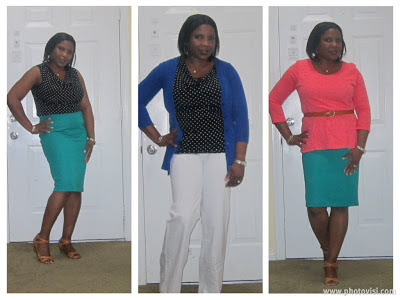 I was able to recreate four of these outfits with pieces from my closet. I used your pictures and the website Audrey always recommends - Go Chic or Go Home!